This is the true story of Manny Balestrero, an honest hardworking musician at New York’s famous Stork Club. When Manny is mistaken for a man who has committed a string of armed robberies his world is thrown into turmoil. He protests his innocents and tries desperately to clear his name with authorities, but wile doing so his beloved wife begins to fall apart under the train of the whole ordeal. 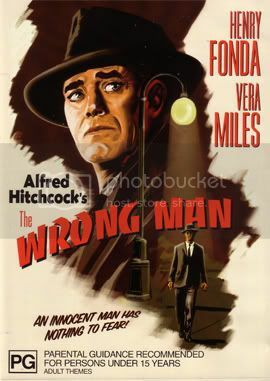 Alfred Hitchcock delivers a compelling story full of tension that made me as the view feeling genuinely frightened for Manny’s dilemma. The plot is simple but it never gets boring. It does a great job of really drawing you in, making you feel that you’re right in there with the characters in some scenes. The imagery is spellbinding, very stylish with great use of shadows that really enhance the film’s rather sinister tone. Henry Fonda is excellent as Manny Balestrero who is a devoted husband and loving father to his children, proving that he is well suited for this type of Character. Vera Miles who later goes on to appear in Hitchcock’s Psycho as Janet Leigh’s sister, plays Manny’s wife, who is very convincing as a woman that is raiding descending into the very depths of despair over her husband’s terrible ordeal. There is also a small appearance by a pre Hogan’s Heroes and talented character actor Werner Klemperer as psychiatrist who is treating Manny’s distraught wife. The film ends very quickly once Manny’s ordeal is behind him, it does feel a little rushed but it is on a positive note which is welcomed and it answered he questioned that I was begging to worry that might not be answered. Overall another fine piece of work from mater filmmaker Alfred Hitchcock that any fan of his and the genre will most certainly enjoy. Nice review and great to see some else appreciating a lesser known Hitchcock. I reviewed it here and Tom's is just below, as part of our mammoth Hitchcock marathon, which you might appreciate a read through. That marathon was so long, I created an appendix for it! You might enjoy that too: Hitchcock marathon appendix. If you want to add anything to those threads, don't worry about them being old. On this forum, we like the review threads to get resurrected. Thank you, I appreciates the comments. Your review is very good. I've only seen a handful of Hitchcock's movies. Psycho, The Birds, Vertigo, The Wrong Man and Rear Window, which is my absolute favourite. It would certainly be worth your while digging back a little further. The 39 Steps and Strangers on a Train are must sees for classic Hitch. North By Northwest too, from his more modern period. I'd suggest you might appreciate Bicycle Thieves as well, which you'll have seen I name-checked with The Wrong Man. Italian Neo-Realism? That's full on film nerd territory right there! But seriously, when you read about Bicycle Thieves and Italian films from that period, you're justified in thinking, "why would I want to put myself through that?". You responded so well to The Wrong Man though, I'd be interested in what you might take from that film. I have to say the Bicycle Thieves sounds very interesting. Hopefully it won't be hard to get a copy. I notice your review of Night of the Hunter, that's an amazing film. I watched earlier this year for the time. That is how it is supposed to be. As somebody (forgot who) famous once said (and I paraphrase, as I forgot the details): "When the monster is dead, the movie is over." And I agree, too many films keep going pointlessly after the climax. Sure, it's generally more important for monster (horror) films, but I feel it also applies to others; like, very (in)famously to Lord of the Rings: The Return of the King (when the trilogy is watched in its entirety the endings are less painful, actually). All unanswered question should be resolved before the climax, and if that's impossible for some reason, then please be quick.